Steve Kerchee, a security specialist with Durango High School, checks to see if the new ID/access card for Jon Wieland, a security specialist at Big Picture High School, works on a door at DHS during a security tour Thursday. 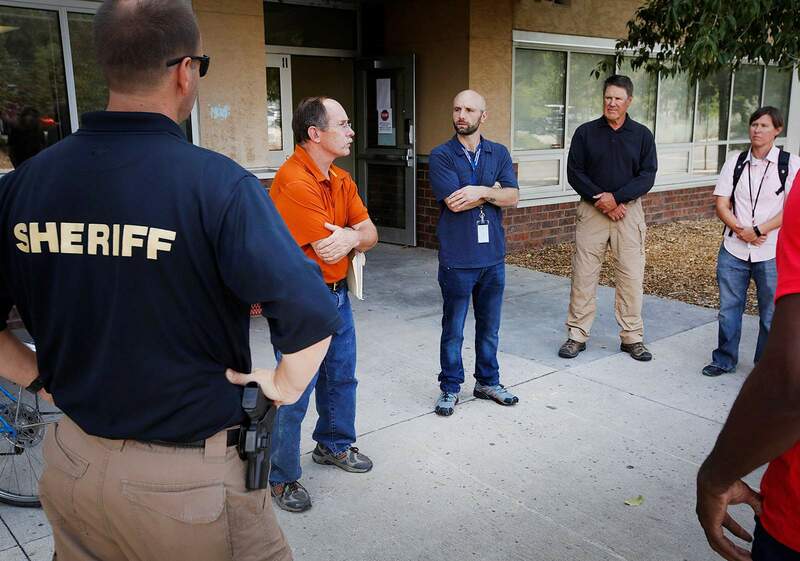 Tom Boyce, second from left, a retired police officer who is now a security contractor with Durango School District 9-R, talks with a group of Durango School District 9-R security personnel and La Plata County Sheriff’s Office school resource officers on Thursday. The group toured Durango High School and every 9-R school building to conduct site surveys and discuss potential areas of concern. 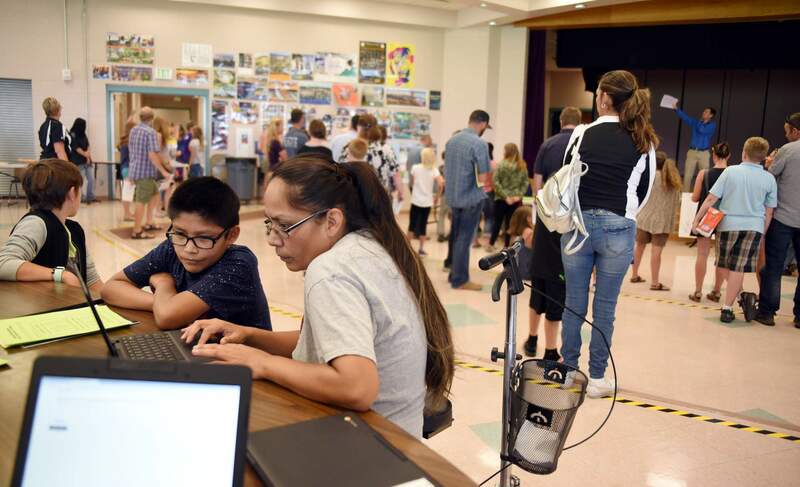 Utanya Sonnie updates the records on file for her son, incoming sixth-grader Dylan Kanuho, 11, at the student and family check-in session Tuesday at Escalante Middle School. Sam Yeargin, 11, in incoming sixth-grader at Escalante Middle School, checks a list to see who will be in his classes during a student and family check-in session Tuesday at the school. Sam is the son of Kim, right, and Chris Yeargin. Kerri Nichols, left, was checking the list for her child, who could not be at the event. 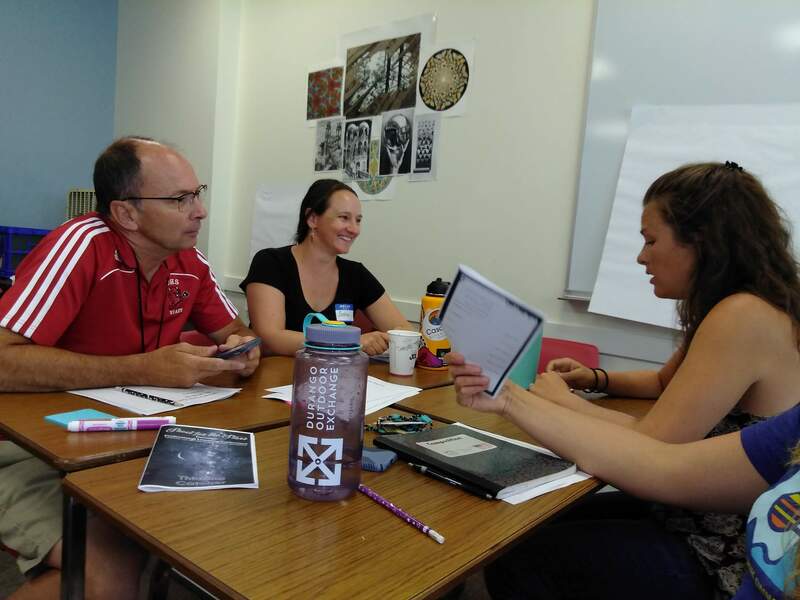 Dale Garland, Sasha Creeden and Carolyn Blehm prepare for the new school year Tuesday during teacher training at Durango High School. 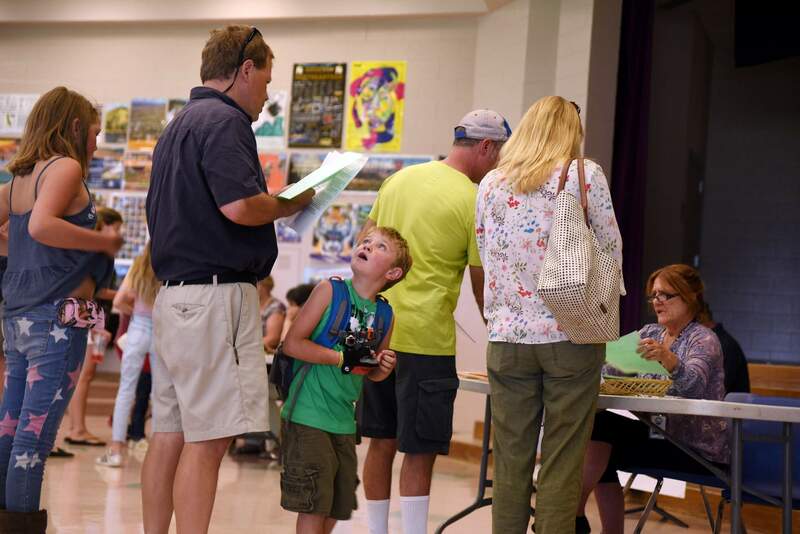 Isabella Rodriquez, 16, clockwise from bottom, Jaelin Mohar Rodriquez, 12, incoming sixth-grader Dylan Mohar Rodriquez, 11, and mom Bea Mohar check Dylan’s crew list with fellow parent Sean Hein during at the student and family check-in session Tuesday at Escalante Middle School. Isabella, Jaelin and Dylan are the children of Mohar and Alex Rodriquez. Lisa and Lily Bandy, 10, fill out forms for Lily’s upcoming sixth-grade year, while Bandy’s son, Adrian Delancy, 5, plays on a phone during the student and family check-in session held Tuesday at Escalante Middle School. A more violent, harsh world is increasingly hard to ignore. Sadly, the first day of school in Durango reflects that. Durango schools continue a journey that increasingly emphasizes safety, security and meeting the social and emotional needs of students. The Columbine High School shooting in April 1999 initiated a period of growing concern for school safety, and concern only intensified in December 2017 when a school shooting at Aztec High School left two students and the shooter dead. 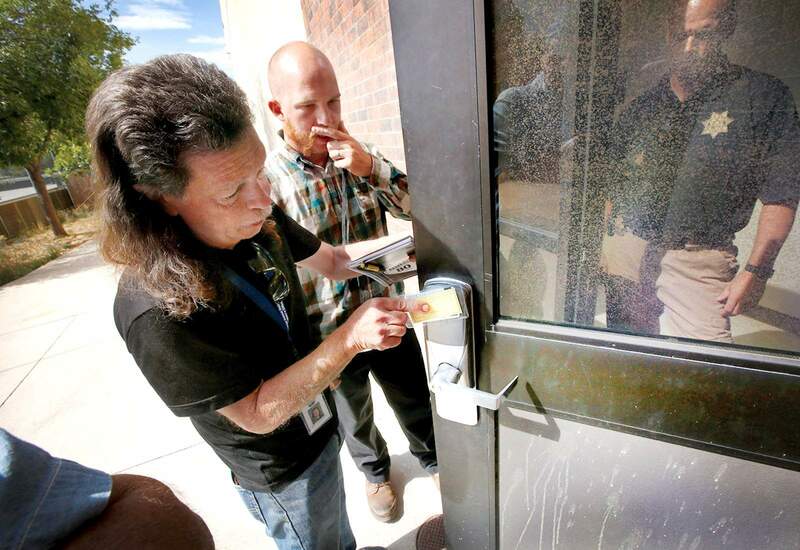 “We’ve certainly seen a greater awareness of school security in recent years by the general public,” said Durango School District 9-R Superintendent Dan Snowberger. When the district first secured and locked entry doors at elementary schools three years ago, Snowberger said many Durangoans decried an atmosphere in which schools were more closely resembling prisons. Now, he said most parents are looking at how security can be ramped up across all schools. “There’s wider recognition that there are people out there who are willing to harm children, and no one is impervious to that,” he said. 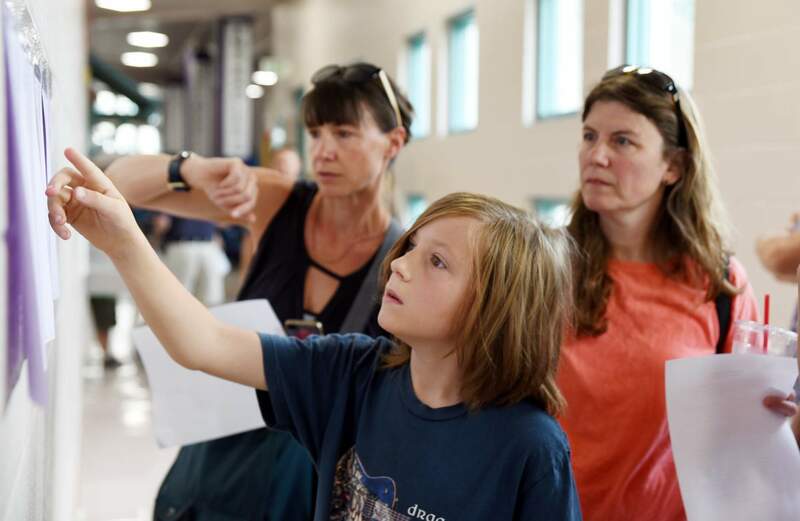 Security enhancements are not limited to 9-R.
Katie Riley and her daughter, incoming sixth-grader Aidan Riley, 11, take a tour of Escalante Middle School during the student and family check-in session Tuesday. Sean Woytek, head of school at Animas High School, said it too has added a card-entry system for all its doors for use by both students and staff members. Involvement of parents and the formation of Parents for Safer Schools to push for augmented security measures, Snowberger said, help the district tap community voices to guide its security upgrades. The school district is creating a safety task force, which currently has 23 members. The group will hold its first meeting before the end of the month. The task force – comprised of parents, community members, students and 9-R staff members – will report to Snowberger, who will make recommendations to the school board to improve school safety and security. The task force will also guide a grant application process for a School Access for Emergency Response grant. The SAFER state grant, created by a bill sponsored by Sen. Don Coram, R-Montrose, aims to improve emergency communications at schools by making school radio communications mesh with local fire and police departments. Addressing social, emotional needsA key step on the path to greater school safety and security is meeting the emotional and social needs of students, Snowberger said. While school bullying and taunting has always been present, Snowberger said the rise of social media has broadened the problem to a 24/7 issue that students can’t escape. 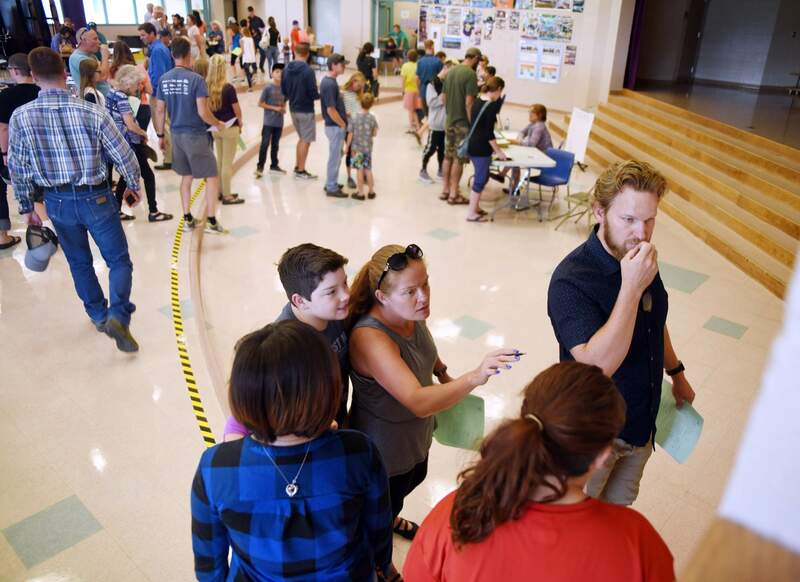 From left, Ruby, 11, Chris and Eli Hamilton, 7, wait in line to hand in Ruby’s immunization records at the student and family check-in session Tuesday at Escalante Middle School in Durango. Ruby and Eli are the children of Chris and Molly Hamilton. Seven new positions were created for school year 2018-19 to meet the social and emotional needs of students. Samantha Tower, coordinator of exceptional student services, said the new employees, specialists in dealing with mindset and behavioral issues, will help individual students, teachers, counselors and other members of a school’s community deal with emotional needs of students. The positions are designed with some flexibility – allowing them to adapt to the individual needs of students, their schools and their communities, Tower said. 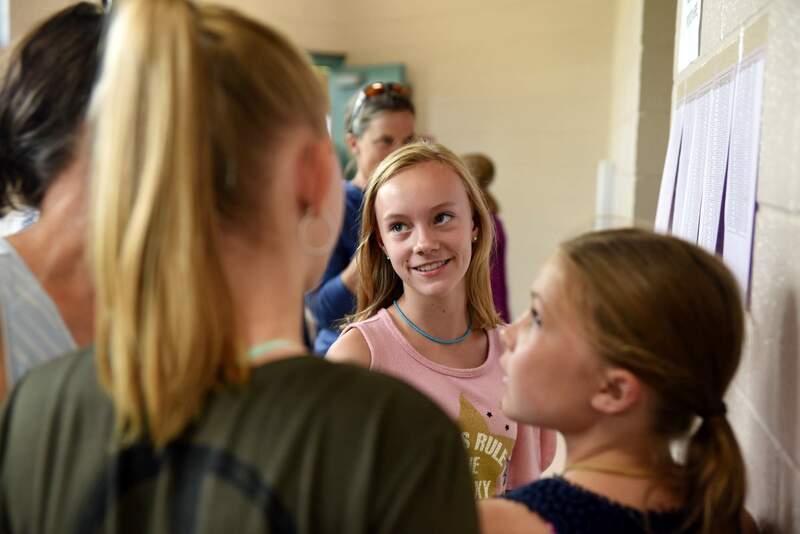 Olivia Becher, 11, an incoming sixth-grader at Escalante Middle School smiles after checking the crew list to see who will be in her classes at the student and family check-in session held Tuesday. Olivia is the daughter of Verity and Justin Beecher of Durango. Building strong relationships among students, teachers and school staff members, Snowberger said, is essential not only to build emotional and social skills of students and make them more resilient to life’s ups and downs, but as the key first line of defense in ensuring school security. It is students themselves who are likely to first recognize problems that could lead to a security risk. The Safe2Tell program that allows students and family members to anonymously report suspected threats to schools or students who may be contemplating suicide is based on creating strong relationships with students and families. Morris calls Safe2Tell a foundational pillar in building safe and secure schools. Durango High School has put in place a visitor management system using RAPTOR Technologies that will allow it to check driver’s licenses and other state-issued IDs quickly in criminal databases for sexual and violent offenses. The system can also provide information on custodial issues with students. It will be used to provide visit-specific identification tags for all school visitors.DHS has added a fourth security officer on campus.A separate school security officer and school resource officer will be assigned to the Pueblo Community College Southwest, which is located at DHS but has its own separate entrance and parking lot.The high school’s access doors have decreased from 54 to 11, and all doors can be controlled by an automatic door-locking system. Some doors will be programed to allow use during passing periods, but they will be locked at other times.Across all 9-R schools, ballistic film, which is resistant to bullets and prevents windows from shattering, has been added to all glass windows and doors at school entries. The film has also been added to some interior windows and doors, and the film will be added to more windows and doors in phases throughout the school year.The school district is in discussion with the Durango Police Department and the La Plata County Sheriff’s Office about adding additional school resource officers. The district currently has four. The first new resource officer will probably come from the police department.Tim Maher, a member of Parents for Safer Schools, said he’s happy with increased measures 9-R has taken, but he adds there’s more room for improvements. “It’s just important to not let our eyes off the goal. There are still threats we need to address, but generally, we have been pleased with the measures 9-R has taken. But we still need to remain vigilant,” said Maher, who has a son attending DHS.